The partisan rift is startling. How local newspapers handle major national stories can tell a lot about the area they represent. That was especially true in the aftermath of Monday's Supreme Court ruling to limit the Affordable Care Act's contraception mandate. 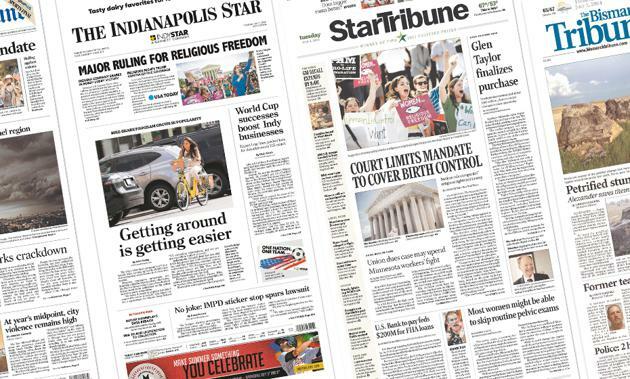 Front pages from across the country either proclaimed "A Major Victory for Religious Rights" or "Court Limits Birth Control Rule." The subtleties in the headlines speak to the political leanings across the country and how different people interpret the Court's decision. The more conservative Journal writes "Grants," while the left-leaning Times says, "Limits." Displayed prominently in an Indiana newspaper, while nearly ignored in the San Francisco paper. The Chicago paper focused on contraception, while the North Dakota paper focused on "religious rights." Again, "religious freedom" versus "birth control." Some newspapers make a point to focus on local issues. The lead headline in The Des Moines Register is about the upcoming Iowa Caucuses, while the Alabama paper focuses on Southern Baptists. Some headlines heralded Hobby Lobby's victory, while others stuck to the Supreme Court's actions. The readership for a newspaper in San Francisco is a lot different than the readership in Oklahoma City. It makes sense that the headlines would reflect that difference.